On Sept. 14, 2015, LIGO's detectors made the very first direct detection of gravitational waves, just two days after scientists restarted the observatory as Advanced LIGO—an upgraded version of LIGO's two large interferometers, one located at Hanford, Washington, and the other 3,000 kilometers away in Livingston, Lousiana. After analyzing the signal, scientists determined that it was indeed a gravitational wave, which arose from the merger of two massive black holes 1.3 billion light years away. Three months later, on Dec. 26, 2015, the detectors picked up another signal, which scientists decoded as a second gravitational wave, rippling out from yet another black hole merger, slightly farther out in the universe, 1.4 billion light years away. Now with LIGO's latest upgrades, members of the LIGO Scientific Collaboration are hoping to detect more frequent signals of gravitational waves, arising from colliding black holes and other extreme cosmic phenomena. MIT News spoke with Peter Fritschel, the associate director for LIGO at MIT, and LIGO's chief detector scientist, about LIGO's new view. Q: What do you hope to "hear" and detect, now that LIGO is back online? A: We definitely expect to detect more black hole mergers, which is still a very exciting prospect. Recall that in the first run we detected two such black hole binary mergers and saw strong evidence for a third merger. With the modest improvement in sensitivity and the plan to collect more data than we did before, we should add to our knowledge of the black hole population in the universe. We would also love to detect gravitational waves from the merger of two neutron stars. We know these systems exist, but we don't know how prevalent they are, so we can't be sure how sensitivity we need to start seeing them. Binary neutron star mergers are interesting because (among other things) they are thought to be the producers and distributers of the heavy elements, such as the precious metals, that exist in our galaxy. hope, will now be able to tune in to gravitational waves—and the extreme events from which they arise—that emanate from farther out in the universe. Q: What sort of changes have been made to the detectors since they went offline? A: There were different sorts of activities at the two observatories. With the detector in Livingston, Louisiana, we did a lot of work inside the vacuum system, replacing or adding new components. As an example, each detector contains four test masses that respond to a passing gravitational wave. These test masses are mounted in complex suspension systems that isolate them from the local environment. Previous testing had shown that two of the vibrational modes of these suspensions could oscillate to a degree that would prevent the detector from operating with its best sensitivity. So, we designed and installed some tuned, passive dampers to reduce the oscillation amplitude of these modes. This will help the Livingston detector operate at its peak sensitivity for a greater fraction of the data run duration. On the Hanford, Washington, detector, most of the effort was geared toward increasing the laser power stored in the interferometer. During the first observing run, we had about 100 kilowatts of laser power in each long arm of the interferometer. Since then we worked on increasing this by a factor of two, to achieve 200 kilowatts of power in each arm. This can be quite difficult because there are thermal effects and optical-mechanical interactions that occur as the power is increased, and some of these can produce instabilities that must be tamed. We actually succeeded in solving these types of problems and were able to operate the detector with 200 kilowatts in the arms. However, there were other problems that cost sensitivity, and we didn't have time to solve these, so we are now operating with 20 to 30 percent higher power than we had in the first observing run. This modest power increase gives a small but noticeable increase in sensitivity to gravitational wave frequencies higher than about 100 hertz. We also gathered a lot of important information that will be used to plan out the next detector commissioning period, which will commence at the end of this six-month observation period. We still have a lot of challenging work ahead of us to get to our final design sensitivity. Q: How sensitive is LIGO with these new improvements? A: The metric we most commonly use is the sensitivity to gravitational waves produced by the merger of two neutron stars, because we can easily calculate what we should see from such a system—but note we have not yet detected gravitational waves from a neutron star-neutron star merger. The Livingston detector is now sensitive enough to detect a merger from as far away as 200 million parsecs (660 million light years). This is about 25 percent farther than it could "see" in the first observing run. For the Hanford detector the corresponding sensitivity range is pretty much on par with what it was during the first run and is about 15 percent lower than these figures. Of course in the first observing run we detected the merger of two black holes, not neutron stars. The sensitivity comparison for black hole mergers is nonetheless about the same: Compared to last year's observing run, the Livingston detector is around 25 percent more sensitive and the Hanford detector is about the same. But even small improvements in sensitivity can help, since the volume of space being probed, and thus the rate of gravitational-wave detections, grows as the cube of these distances. 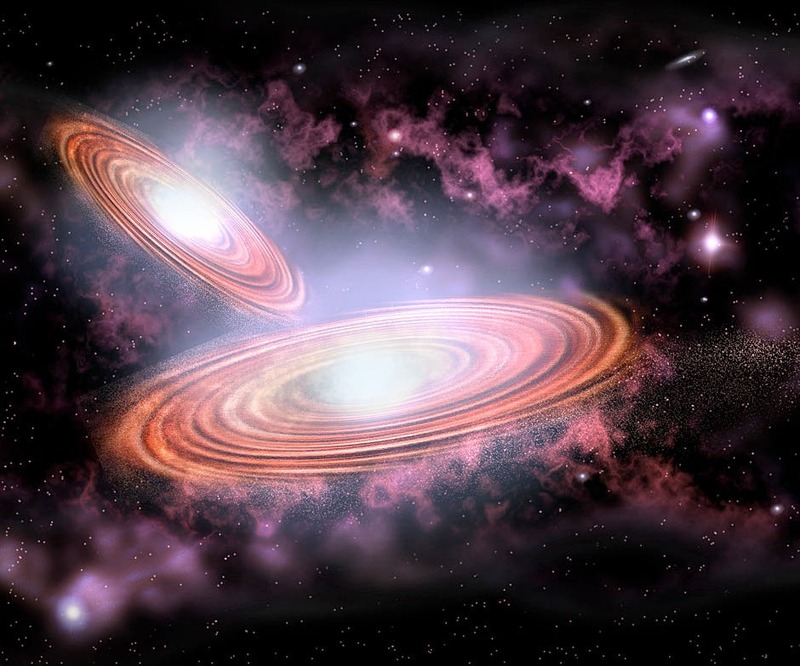 Merging Black Holes –"Will Reveal the Existence of Gravity Waves"